It would be impossible to imagine the music of the BomPlenazo Artists Collective, which played a large-cast concert of Afro-Puerto Rican roots music on Saturday night at Hostos Community College in the Bronx, without the movement and dancing that framed, refracted and amplified it. Ben Ratliff writes in this review for The New York Times. Generally, the drummers occupied the left of the stage and the singers the right, with bass, keyboards and horns at the back. But everybody moved, casually or theatrically, and all roles stayed fluid: There was little division onstage between being a musician and being a dancer, and little division in the audience between hearing with the ears and the eyes. The two-hour concert was a roaring heterophony, street-music jams that incorporated, and were improved by, the small disjunctions among its drummers and singers. But the climaxes arrived in one-on-one encounters: direct, point-counterpoint engagements of listening and improvisation. 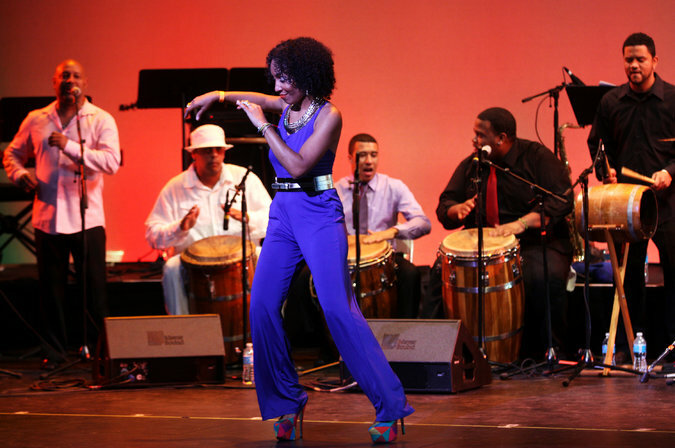 The event was the capstone of BomPlenazo 2014, the eighth biennial celebration of Afro-Puerto Rican music and dance at Hostos. (The festival is supervised by Hostos Center for the Arts and Culture, the powerful locus for Latino art founded in 1982.) At the heart of it was bomba and plena, traditions of voice, drum and movement that thread through the history of Puerto Rico’s music and, by extension, the history of New York’s. Bomba is at least three centuries old, percussively deep and dense, involving barrel-shape drums called barriles; the sources of its rhythmic patterns and practice are West African. Plena is a little more than a century old, oriented around a kind of topical or news-carrying singing. Its drums are panderetas, shallow and tambourine-shaped, held in one hand and struck with the other. And at the heart of this particular concert was Juan Gutiérrez, who in the early ’80s helped start Los Pleneros de la 21, a New York ensemble that has added other elements to bomba and plena — salsa, hip-hop — while preserving the core of each. He was Saturday’s musical director, and he gathered 19 musicians for it. Many were regular or satellite members of Los Pleneros de la 21 or Viento de Agua, a group from San Juan, P.R., started in the late ’90s by the percussionist Héctor Matos (known as Tito) that expands the old languages even further. So here you had a two-tiered tradition: that of the original and that of its updates. The first half concerned plena. Plena drummers organize themselves into rhythm keepers and improvisers; Mr. Matos is an improviser, playing the higher-pitched requinto drum, and he sounded beats in between beats, giving the rhythm complexity, funk and deep texture. One of his collaborators in Viento de Agua, Ricardo Pons, played clarinet through the concert and especially through the first half, evoking Brazilian choro music more than traditional plena; the salsa-band veterans Iván Renta and Papo Vázquez played tenor saxophone and trombone, improvising and arranging on the fly. But the concert’s magic center, its strongbox, were massed drums and voices, urged on by Mr. Gutiérrez. Sometimes, as in “Quién Será,” written by the group’s singer and dancer Norka Hernández-Nadal, they expanded into Cuban-sounding montuno grooves, with help from the pianist Desmar Guevara and the bassist Donald Nicks. And sometimes Mr. Matos locked in against one other pandereta player, making a joint rhythm out of individual parts, speeding it up and slowing it down, assembling and disassembling. In the second half, bomba took over. With seven singers and four percussionists performing, you could hear the age in the music, its slow and powerful gait. Each song had its solo singer, each with different vocal styles: Mr. Matos’s broad and casual, Alexander LaSalle’s narrow and needling. And the dancing began to intensify, with women holding up and shaking the hems of their skirts, and men using their feet as percussive strikers. At one point a guest appeared from the wings: Roberto Cepeda, who with his family has helped spread and teach bomba and plena since the 1930s. He approached the drummer Nelson Matthew González, stood in place, and started quaking; then he splayed and hunched his body, balancing on the outside edges of his feet, and began to make piquetes — abrupt rhythmic body gestures, followed precisely by the drummer, such that Mr. Cepeda became the conductor of his own concerto. The solo turned into a duet, and then they were working in tandem, both directing and following each other.